I keep trying to move on to other books, other series but I would feel lost. I have grown to love this series and I would absolutely miss the characters. Things have gotten pretty juicy in Three Pines! Indeed! There were some developments in this installment that peaked my interest . I am very curious how it will all play out. I love Louise Penny’s writing. It makes me wonder how a conversation would sound if talking to her in person. This novel was interesting on many levels, and was actually insightful. I just downloaded the next novel without hesitation, I can’t let much time pass between them, I am officially a Three Pines junky. I can see why "Grumpy" gave up on the recording but once past the first disc, it is a great story. When listening, you can always repeat the tracts till made clear. If this book has a redeeming feature, I couldn't find it. I listened to the entire first disc, could hardly make heads or tails about who was who, and simply could not get into it. I love the Gamache series by Louise Penny. It is written so well, you feel like you are there. I can't wait to finish the series. I love the Louise Penny Ganache mysteries!!! The narrator is excellent. I enjoy learning the correct pronunciation of the French words. I specially love the descriptions of the setting of this beautiful yet murderous town of Three Pines. It reminds me of the quirky TV series Murder She wrote (I know it was a book series first but never read the books). The Ganache books are so much more intelligent and interesting however. I will be listening to or reading each and every book!!!! 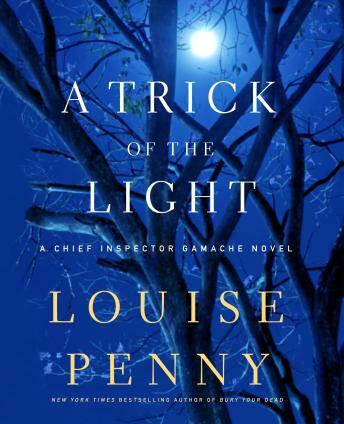 Louise Penny has helped me enjoy mysteries. Trick of the Light is typical of her writing which takes you through all the intricacies of the plot without feeling obligated to detail the dark side of the actual crime scene. The setting comes alive to the point that you want to be there in the bistro! Though I didn't, I recommend that you read in chronological order.